HHP-SG Series are discontinued. Looking for a possible substitute, please contact your local customer engineering for details. 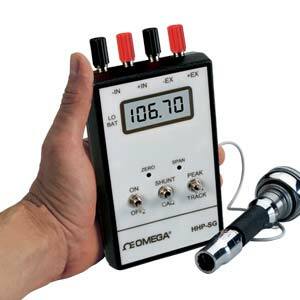 OMEGA’s model HHP-SG is a handheld digital indicator for strain gage type transducers such as load cells, torque sensors or millivolt pressure sensors. It provides excitation voltage for the transducer and displays the readings on a liquid crystal indicator. Front panel zero and span adjustments allow scaling the meter to provide readings in the desired engineering units. The LCD has 3 1/2 active digits (0-1999 counts) and an additional dummy zero if needed. The HHP-SG can display either the actual value of the signal (tracking mode) or the peak value (peak mode). It operates on a standard 9 volt battery, and indicates if the battery is low.